The Harley-Davidson® Sportster lineup, available here at Rawhide Harley-Davidson®, includes some of the most affordable and fun bikes in the Harley-Davidson® lineup. The Forty-Eight® is back for 2017 with its classic, throw-back fuel tank that debuted in 1948, along with a bunch of new upgrades and completely modern features. Despite the bike’s long heritage and classic styling, this is a totally contemporary cruiser that’s ready to ride. When it comes to handling, the Forty-Eight® uses a recipe of tried-and-true features and modern design to deliver confident and comfortable handling at all speeds. Michelin® Scorcher™ Tires: These performance bred tires deliver impressive grip, long-haul durability, and exceptional handling characteristics. Plus, a deep cut tread helps shed rain for wet weather performance. 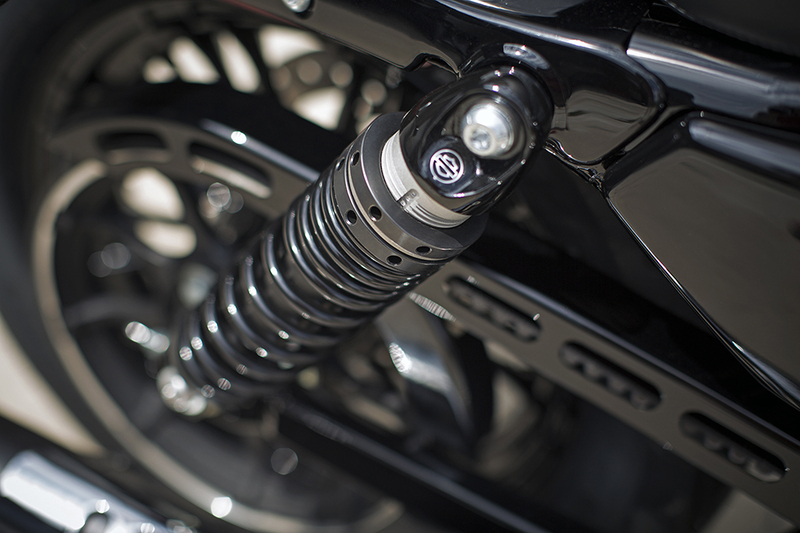 Emulsion Rear Shock: Smooth out those rough patches in your ride with a new emulsion rear shock. Dial in the setting that you need with a pre-load adjustment, from firm and aggressive to plush and comfortable. 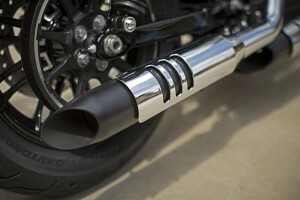 49 mm Fork with Cartridge Damping: The front end of the Forty-Eight® provides added stiffness thanks to big 49 mm stanchions for confident handling. This advanced cartridge dampening technology smooths out the bumps. Split 9-Spoke Wheels: These cast aluminum wheels provide a unique look thanks to their split 9-spoke design as well as their machined and black painted finishes. 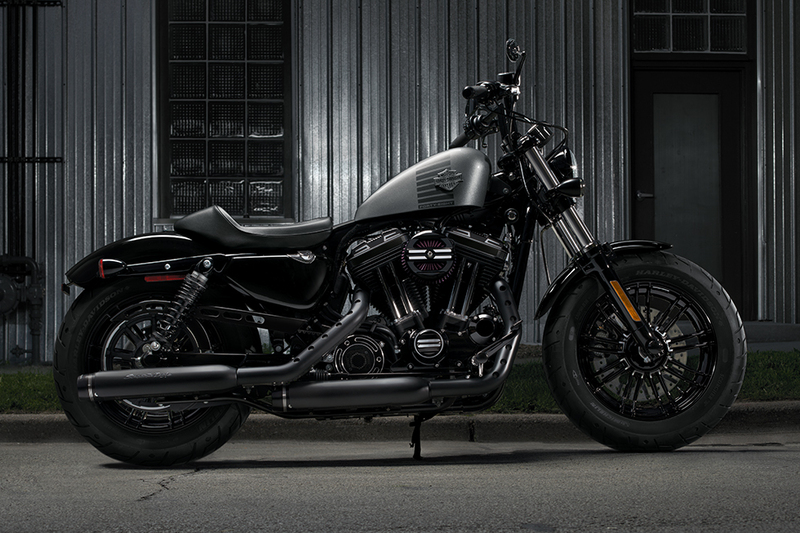 The 2017 Forty-Eight® might resemble post-war custom bikes, but it’s completely modern when it comes to features. Antilock Brakes: This optional feature is offered to provide increased stopping control and power in any condition. You’ll hardly notice the antilock brake system because it’s so well integrated into the design of the brakes. Ergonomic Hand Controls: Smartly designed controls give you the ability to handle anything in comfort and style. These dialed in controls put your hands in the right place and everything you need at your finger tips. Foundation Brake System: Bigger brake rotors, bigger pistons, stronger calipers, steel braided hoses, an all-aluminum master cylinder, reduced friction, and higher efficiency all adds up to more powerful brakes and better stopping performance. Tach and Gear Readout: Never forget what gear you’re in again with the convenient console gear indicator read out, tachometer, and speedometer. 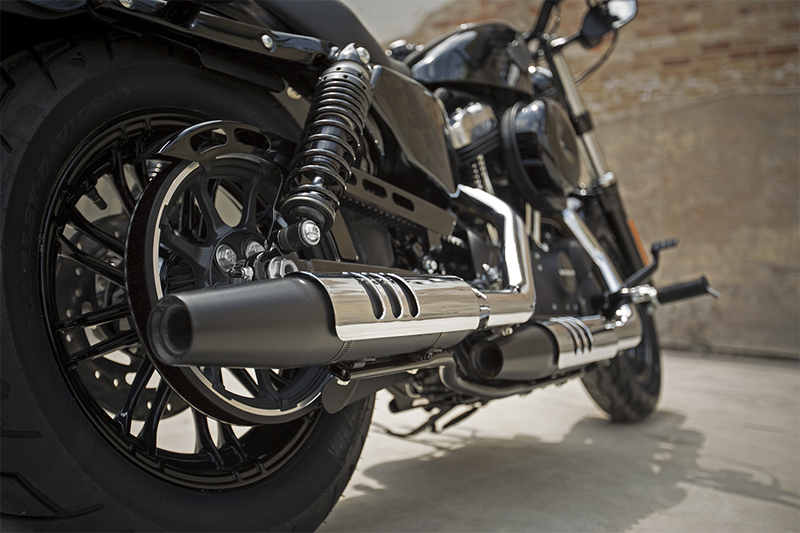 Closed Loop Exhaust System: Harley-Davidson® is looking toward the future by reducing emissions with a new closed loop exhaust system. This preserves the classic sound and feel of Harley-Davidson® powertrains while updating the vehicle for our low-emissions future. 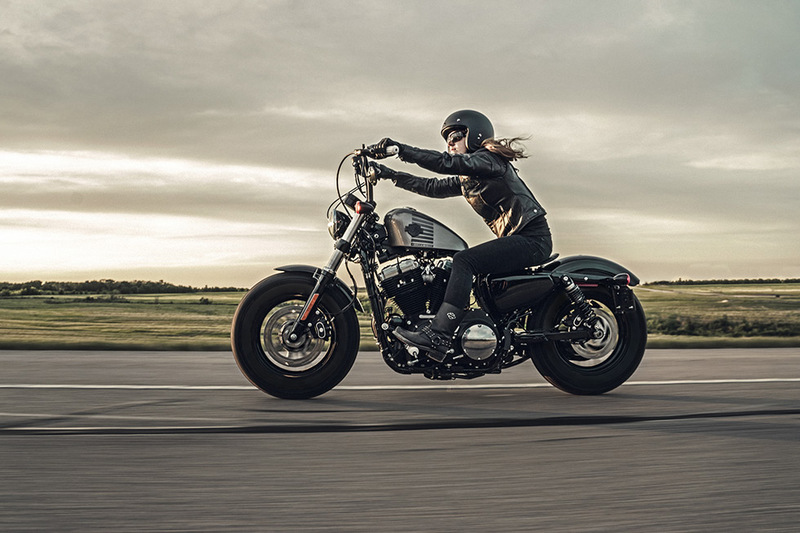 H-D® Smart Security System: Protect your investment with a wireless handsfree security system that automatically arms when you leave the bike and disarms when you approach. This optional feature is installed at the factory. Integrated Electrical System: The Forty-Eight® is equipped with a new body controller that cuts down on the number of fuses, switches, and wiring harnesses for both a cleaner look and less complication. 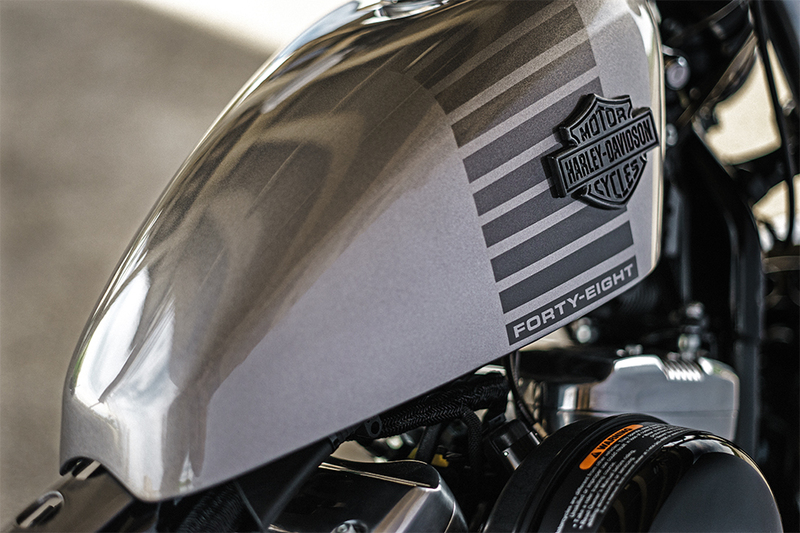 The Forty-Eight®, featuring an unbeatable 1,200cc Evolution engine, is the perfect combination of classic style, modern design, and technological innovation. Harley-Davidson® Styling: The Evolution® engine might be modern, but it still boasts classic styling with a round air cleaner cover, black powder coated cases and cylinders, polished rocker covers, chrome pushrods, and more. It’s a bold statement and a beautiful powertrain. Heritage: The Evolution® engine evolved into its current state back in 1984. 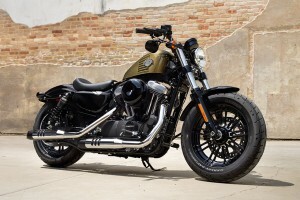 It can trace its roots to the iconic Shovelhead and Ironhead engines, but it’s become a legend in its own right with serious power and reliability. Innovation: Contemporary engineering like aluminum heads and cylinders reduce weight and improve cooling properties. 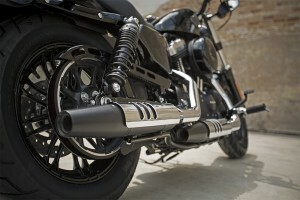 Plus, a rubber mounting system makes sure you can enjoy a smooth ride at any speed. 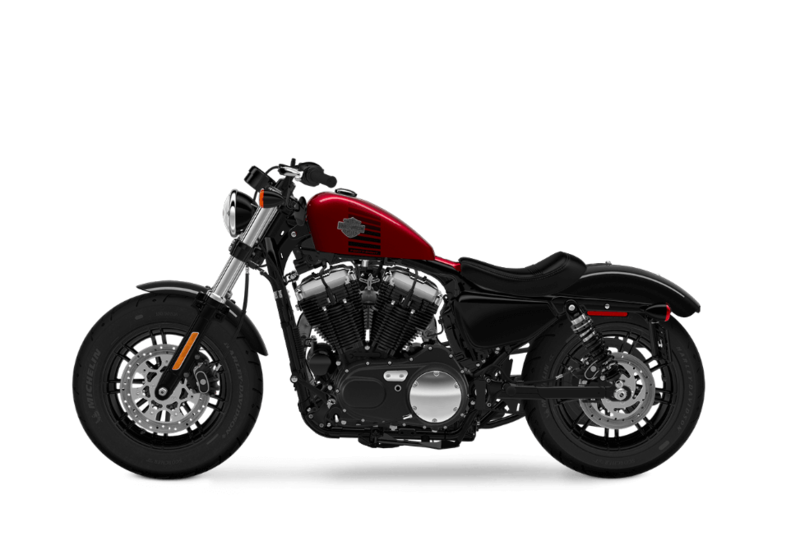 The Forty-Eight® is bred to provide the kind of comfortable, laid back riding experience that a Harley-Davidson® cruiser is known for. Forward Mount Control: With the forward mounted foot controls, you can kick back, stretch out your legs, and concentrate on simply enjoying mile after mile. Low Profile Drag Bars: The slammed, low profile, minimalist look is in full force with these unique drag inspired bars. Of course, they’re also designed to put you in a perfect riding position for cruising around town in style. Low Seat: The seat is solo, just enough to keep you comfortable, and set a mere 26-inches off the ground for confident handling and a low center of gravity. Despite the minimal seat design, it’s still a bike designed around all-day comfort thanks to smart suspension design. Steering Geometry: With steering geometry optimized to provide confident handling at all speeds, this bike is simply a pleasure to ride. The handling is fast, light, agile, and ready to take you anywhere you can dream up. 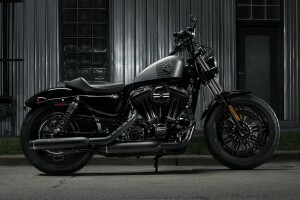 The Forty-Eight® is all about classic Harley-Davidson® styling. It gets its name from the first year that Harley-Davidson® debuted the iconic peanut fuel tank. While that’s a major feature, let’s look at the Forty-Eight’s® other classic design elements. Peanut Fuel Tank: This iconic fuel tank gets traditional styling with an all new Harley-Davidson® badge, distinctive graphics, and old-school lightning holes. Fat Front Tire: The Forty-Eight® also leaves a bold impression with its fat front tire that recalls classic lead-sled culture. It also doesn’t hurt that this big tire provides added grip and a smooth ride. 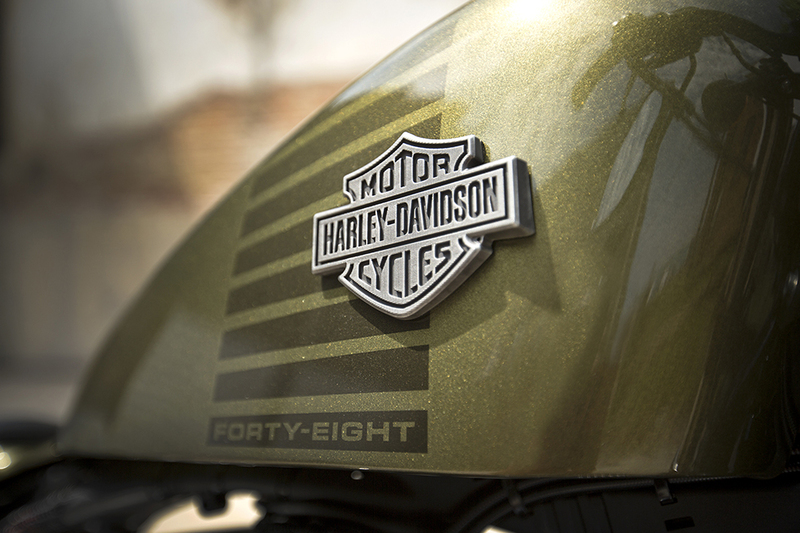 Hard Candy Custom™ Paint: If you’re looking for a unique finish, then consider the Hard Candy Custom™ paint option, with glittering micro flake finishes, custom graphics, and more. 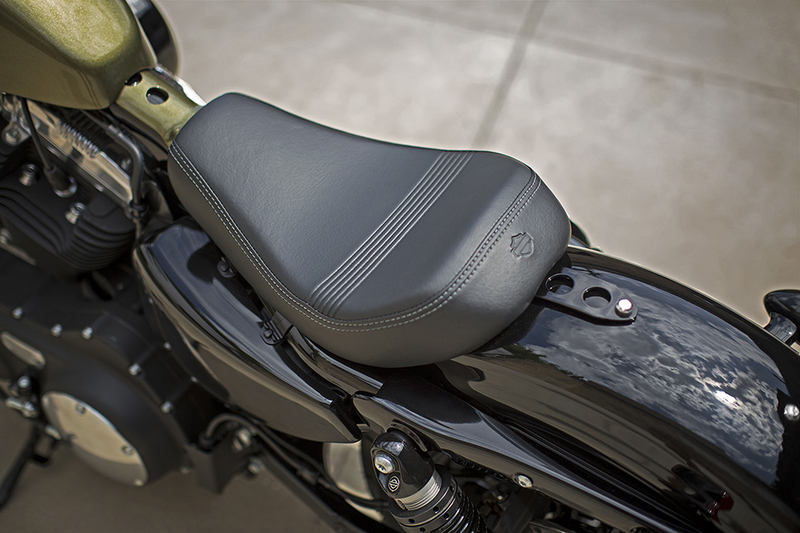 Clean Rear End: The Forty-Eight® gets a fast, smooth looking, minimal rear end by including a chopped fender, a side-mounted license plate, and minimal bullet stop-turn-tail lights. 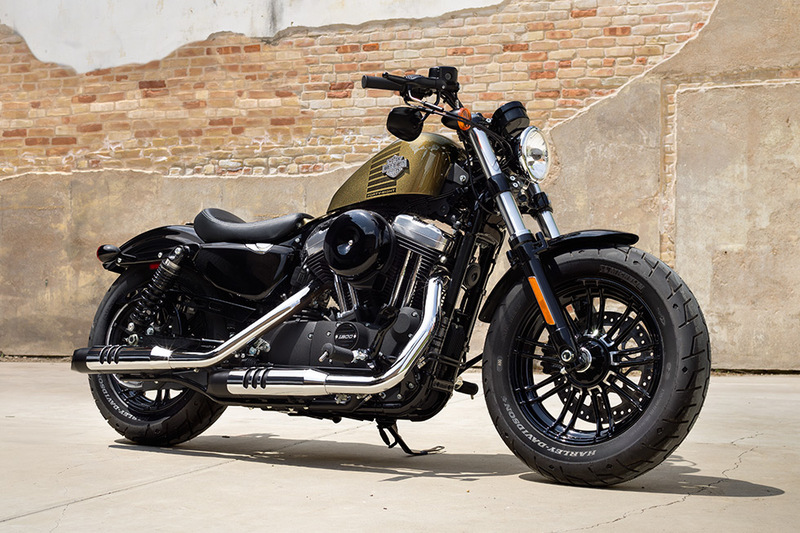 Slammed Front End: The front of the Forty-Eight® boasts slammed drag-style handlebars with under mounted mirrors for a striped down, minimal, hot-rod style look. It also puts you in a distinctive aggressive riding position, allowing you to enjoy the performance capabilities of this distinctive bike.